In the article, “In Defense of Fatima: Defending Marian Theology”, we demonstrate that it is an obligation of Christians to have devotion to the Mother of God. Marian devotion has long been practiced amongst the Angels, as was evidenced by the Archangel Gabriel’s homage to Her who was “full of grace” (Lk. 1:28). Certainly, Our Lord Jesus Christ, who came not to abolish the Law but to fulfill it (cf. Mt. 5:17), fulfilled in a perfect manner the commandment to “honor thy mother” (Ex. 20:12; Lk. 2:51). As soon as He began gathering together disciples, they noted the devotion Our Lord had for His Mother. This is evidenced by the fact that St. John was so struck by the power of Our Lady’s intercession at Cana, that he remembered it and recorded it decades later (cf. Jn. 2:1-11). At the wedding feast at Cana, seeing that the wine had run out, Our Lady desired Our Lord to work a miracle. Though Our Lord declared, “My hour is not yet come,” He would not refuse His Mother, and worked His first public miracle at Her request. On the Cross, Christ made the devotion to His Mother a precept of His religion by telling His disciples, through St. John, “Behold thy Mother” (Jn. 19:27). According to the earliest extant evidence, Mary has long been honored prominently in Christian art and liturgy. 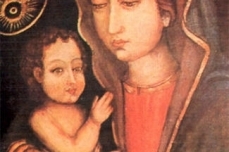 A painting of Our Lady, done by St. Luke the Evangelist, is still in existence in St. Mary Major in Rome, brought there by the Apostles. 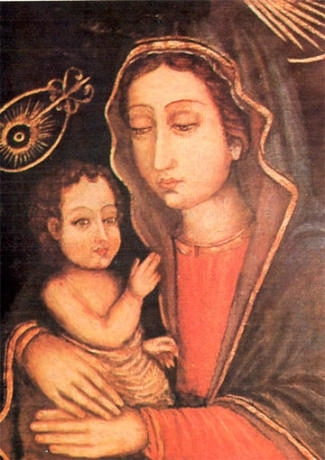 Another painting of Our Lady, also painted by Saint Luke, is found in India, in Madras (now called Chennai) on Mount Saint Thomas. St. Thomas the Apostle had carried it there to India almost 2000 years ago (see Painting of Our Lady by St. Luke below). Thus we can see devotion to Our Lady is of Apostolic origin. Likewise, apostles for the Blessed Virgin have not been wanting. St. Irenaeus, a disciple of St. Polycarp who was himself a disciple of St. John the Apostle, wrote, “As the human race was subjected to death through a virgin (Eve), so it was saved by a virgin (Mary)”. St. Athanasius preached, “O Virgin! You are greater than all (creatures), O Covenant, clothed with purity instead of gold! You are the Ark in which is found the golden vessel containing the true manna … the flesh in which the Divinity resides.” Some of the earliest definitions of the Church councils were of the Blessed Virgin’s Divine Maternity and Her perpetual Virginity. Throughout Catholicism and even in Eastern Orthodoxy, the Liturgy is permeated with the praises of the Blessed Virgin, and has been from time immemorial. The Holy Ghost has given Christians, especially Saints, different means to exercise devotion to the Blessed Virgin Mary. According to Blessed Pius IX, the best and most acceptable form is the devotion proposed by St. Louis Marie Grignion de Montfort (1673-1716). Pope John Paul II said, “This perfect devotion is indispensable to anyone who means to give himself without reserve to Christ and to the work of redemption.” This devotion, which St. Louis calls “a perfect renewal of the Baptismal Vows” (True Devotion to Mary, §120), is a “quick, easy, and secure way to perfection” (§152). All our perfection consists in being conformed, united, and consecrated to Jesus Christ. Our Lord said, “Be perfect as Your Heavenly Father is perfect” (Mt. 5:48). This perfection is in the imitation, union, and consecration of the Christian to Jesus Christ. Imitation: “I have given you an example that as I have done to you, so you do also” (Jn. 13:15); “God … predestined (Christians) to be made conformable to the image of His Son, that He might be the firstborn among many brethren” (Rom. 8:29). Union: “Abide in Me, and I in you. … Without Me, you can do nothing.” (Jn. 15:4-5); “You are all one in Christ Jesus” (Gal 3:28). Consecration: “You are not of the world, but I have chosen you out of the world” (Jn. 15:19); “Be you also as living stones, built up, a spiritual house, a holy priesthood, to offer up spiritual sacrifices, acceptable to God by Jesus Christ” (1 Pe. 2:5). Therefore, the most perfect devotion is that which most perfectly conforms, unites, and consecrates us to Jesus Christ. St. Paul told the Christians: “be followers of me as I also am of Christ” (1 Cor 11:1). To follow in the footsteps of those conformed to Christ is to conform to Christ Himself. Since Mary is the creature that is the most conformed, united, and consecrated to Jesus, the more someone is conformed, united, and consecrated to Mary, the more he is conformed, united, and consecrated to Christ. The devotion St. Louis promotes consists in giving everything – one’s body, soul, exterior goods, and even one’s virtues and the merits of his good works – to Jesus through Mary. Other acts of devotion do an immense good, the first among those is Our Lady’s Rosary. Even that does not, in and of itself, impose an obligation to give everything one has, does, and is – without reserve – to the Blessed Virgin. Once the act of consecration that St. Louis proposes is made, one has given every thought, word, deed, and suffering to Mary, without reserve, unless there is an intentional retraction. This should give comfort to the Christian. It is like the parable of the talents. (Mt. 25:14-30) You and I are the Christians who are, perhaps, given fewer talents, and perhaps are weak and liable to bury them in the sand. The Blessed Virgin is certainly the one who gained the most talents, being “Blessed amongst women” (Lk. 1:42). What this consecration does is it gives the talents of one’s life to the one who has gained many to invest for us. Perhaps from the merits of our life, the Master would be dissatisfied with us. But by giving them to Mary, surely the wise and faithful Servant (the Blessed Virgin), who reaped the interest, will look after us. When Christ comes to us as Judge, there’s no one we would rather see at our defense than His Mother. The perfect gift of self to Mary helps us to conform to Jesus. This is because we are only imitating Him, Who “emptied Himself” (Php. 2:7), and was obedient and subject to Mary, and relied upon Her for everything in His first years. This devotion unites us to Jesus, Who said, “I seek not My own glory” (Jn. 8:50), but sought His Father’s glory “by finishing the work which Thou gavest Me to do” (Jn. 17:4). This devotion to Mary unites us with Him in glorifying the Trinity by giving that by which we glorify God and the merits for our works to Our Lady, who can render God the greatest glory with our small gifts. Through this devotion, we are consecrated to Jesus, by our being set aside for Him by Our Lady. Just as Jacob received the blessing from his father Isaac only by being prepared for it by his mother Rebecca (cf. Gen. 27:1-40), we are set aside for consecration to Jesus most efficaciously by being prepared by the Blessed Virgin Mary. We can often ruin our good works by having a motive that is mixed together with self-love. Now you can understand how much merit slips through our fingers. But if Our Lady presents these merits to God, He will not refuse them. Our Lady will purify any stain of self-love or self-interest. 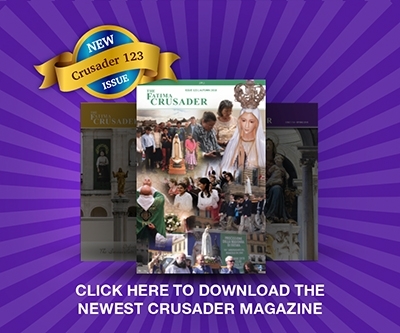 In an extract of Father Paul Trinchard’s book, The Awesome Fatima Consecrations (See Related Articles, “Your Awesome Act of Consecration to the Immaculate Heart of Mary”), the author reflects on the very important personal Act of Consecration to the Immaculate Heart of Mary in light of the prophetic Fatima Message. These inspiring reflections demonstrate how truly awesome this Act of Consecration to the Immaculate Heart is, and what a tremendous impact it can have on one’s life and one’s soul.